However, it is apparent that the protest’s organizers undoubtedly harbor racist, anti-Semitic, homophobic, transphobic and xenophobic beliefs. A ver, segunda llamada para hacer un mítin el 18 de noviembre contra la invasión hondureña, 11 del día, oficina de los pasaportes… puras redes sociales, no quieren actuar. A ORGANIZARSE. 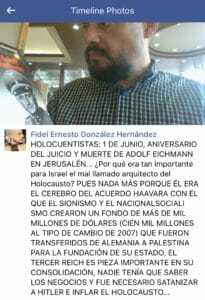 Fidel’s personal Facebook profile is littered with racist and anti-Semitic remarks. His cover photo features a German World War I helmet adopted as a symbol by many neo-Nazi groups. His profile photo also shows him at Friendship Park, on the American side of the Mexico-U.S. border. Alongside his name, Hernández has included the word “Übermensch.” The word was originally used by the 19th-century philosopher, Friedrich Nietzsche, to describe a superior man who could rise above religious authority and impose his own values on others. In another post, Hernández addresses his followers as “holocuentistas” a blending of the word “holocaust” and “cuentista” meaning storyteller (but also has connotations of “liar” in Mexico) and marks the anniversary of Adolf Eichmann’s execution. Eichmann is widely believed to have been the architect of the Holocaust. The post goes on to assert that Hitler and his Third Reich was “an important piece” of the foundation of the State of Israel, echoing the conspiracy theory that Hitler was a Zionist and used the Holocaust to promote the settlement of Jews in Palestine. Hernández’s Facebook pages are also full of derogatory and inflammatory statements towards the transgender community. In one post, Hernández is dressed as Fidel Castro holding a doll wearing a t-shirt with “baby Trudeau” scrawled across its chest. 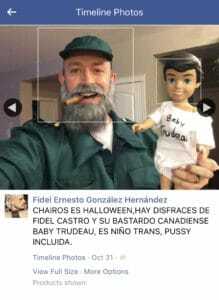 Hernández’s photo caption reads “There are costumes of Fidel Castro and his b*stard Canadian baby Trudeau, it’s a trans child, p*ssy included”. 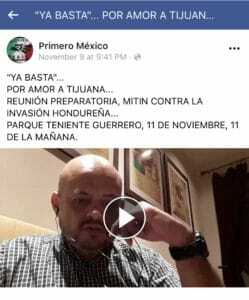 In the runup to the protest, Hernández was active on a public group entitled “Primero México” or “Mexico First.” He shared videos calling for the Mexican public to join the protest in Tijuana, referring to the caravan as a “Honduran Invasion”. Recently, Primero México appears to have deleted months and perhaps even years of its most offensive posts. 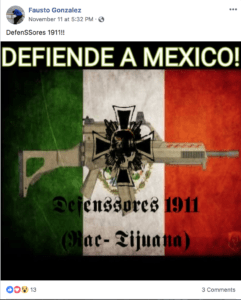 The Mexico First group has posted many offensive messages. Hill Reporter downloaded screenshots for some of the offensive and inflammatory material routinely posted on its wall. 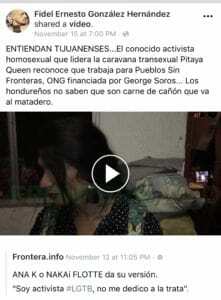 Hernández shared a video on the group’s wall of a transgender migrant reportedly traveling with the caravan. The accompanying message referred to her work at the immigration rights group “Pueblo Sin Fronteras” and suggested she was being financed by George Soros. The message ended with a thinly-veiled threat, “the Hondurans don’t know that they are canon meat that is heading for the slaughterhouse”. 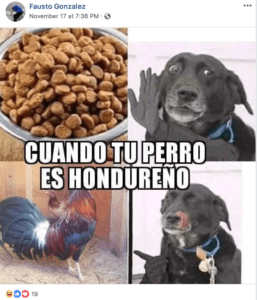 In another xenophobic post, a meme of a dog eating a chicken appears with the tagline, “When your dog is Honduran”. International media outlets have given Hernández and those like him a voice through which they can spout their personal prejudice and bigotry. In an interview with RT, a Kremlin-backed news outlet, Hernández said, “the priority is to defend our city,” suggesting it was a matter of public order. In a video taken at the protests in Tijuana, Hernández appears with a fellow protestor in which the men defend their views as “nationalist”. They state, “borders exist to separate us from other populations for legal reasons”. 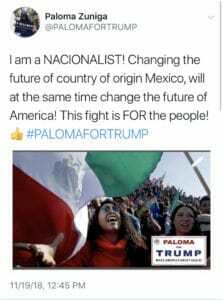 Other high-profile protestors have attempted to defend their anti-immigration sentiment as “nationalism.” Paloma Zuniga, a dual Mexican-American citizen and the founder of a Facebook page called “Paloma for Trump,” which has drawn a following of more than 32,000 Facebook users, was also at the march in Friendship Park. 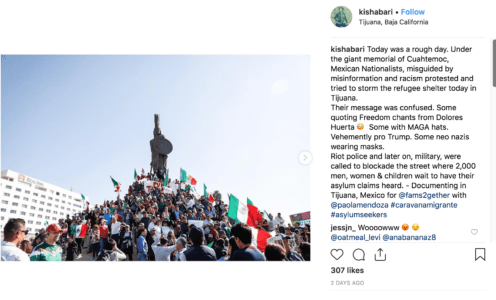 She published a post on Facebook adopting a similar rhetoric to that used by Hernández, depicting the situation in Tijuana as a war between the local population and the “invading” migrants. “I am a Nacionalist!” it read, “this is a fight FOR the people”. 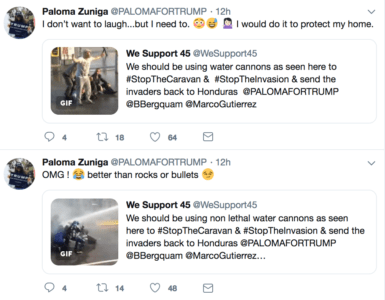 In another post, Zuniga appeared to promote the use of water cannons against arriving migrants. She shared a post by We Support 45 which depicted supposed migrants being sprayed with the powerful water jets alongside her own caption which read “OMG! Better than rocks or bullets”. Zuniga lives in Chula Vista, California. A reverse image search revealed that in reality, neither of the images depicted migrants. The photos were taken during an anti-government protest in Turkey in 2013 after police deployed a water cannon to disperse the protestors, as reported in the Daily Mail. When Ingraham asked Zuniga if she was scared that people would brand her a racist, Zuniga replied, “I already get called a racist”, to which the Fox host exclaimed, “that’s great. Wow”. Other elements of the Trumpian narrative were also on display in the Tijuana protests. Eyewitnesses reported MAGA hats among the crowds. In some places, the fighting narrative threatened to spill over into violence. Protestors allegedly attempted to storm the refugee shelter where more than 2,000 migrants, including women and children, were awaiting a hearing for their asylum claims. Riot police and the Mexican military were deployed to the scene and had to blockade the street, clearly visible in a video shared to Hernández’s timeline. Discrimination has rattled around Facebook groups, internet chatrooms, and obscure message boards since the beginning of the internet. But an outspoken Nazi sympathizer organizing an anti-immigration protest which made violent threats against migrants should be a cause for alarm, not just in Mexico, but across North America. And this type of individual should never be given a platform to speak on Fox News and other outlets who unabashedly ignore their outward racism and Nazi-loving sentiments.